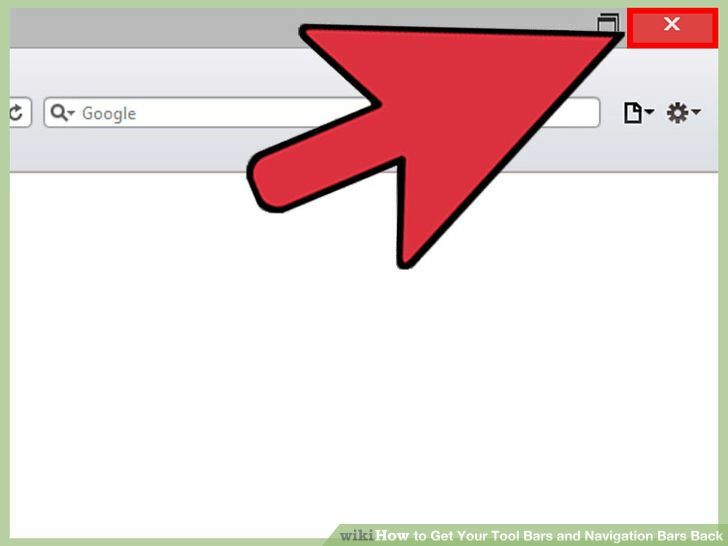 Internet browsers offer the ability to save bookmarks, add extensions, and customize Tool Bars and navigation materials. With so much customization across several different browsers, you may find yourself needing to troubleshoot a suddenly missing component of your normal setup. The most common solutions to this issue are simple to execute and in the process you can also learn how to customize your browsing experience. Results and exact menu headings may vary a bit across different versions of the browser software as well as across Mac and PC but with a little patience you're certain to be steered in the right direction. Access the View menu. If you're suddenly missing your bookmarks tool bar or some other component that you're used to seeing, a simple fix may be found in the "View" menu. It's located in the upper left part of your screen, along the top menu bar. 'View" should be the 4th option from the left after the "Firefox", "File", and "Edit" menus. Under that menu look for "Toolbars" and "Sidebar" menus for specific components to be toggled as viewable or hidden. 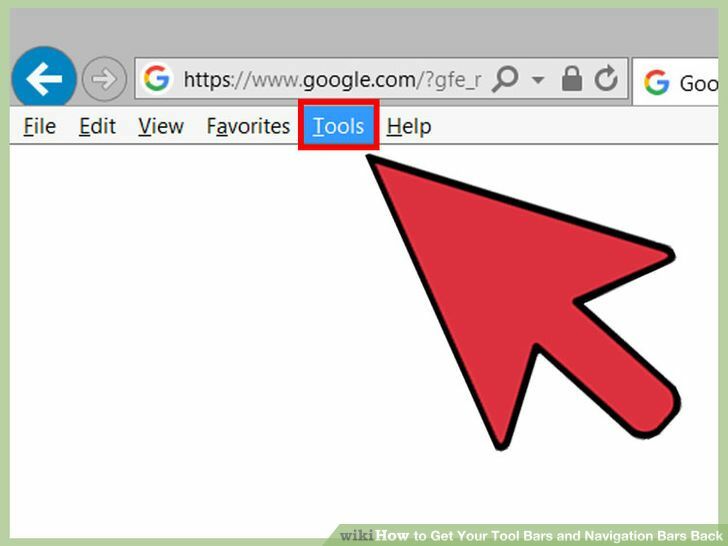 If checked, the tool bar is currently visible, if unchecked it is currently hidden. Right click on a grey section of the window. 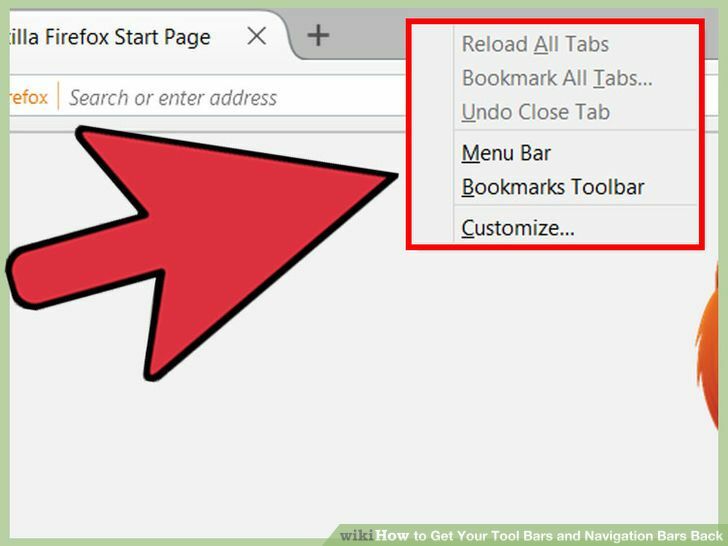 The right click allows you to quickly change the view of the browser by hiding or unhiding your toolbars. Consider customizing your tool bars. 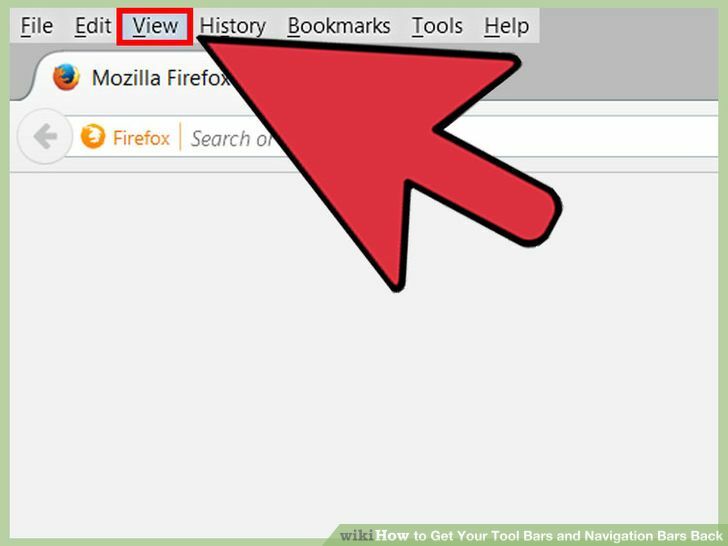 Firefox's upper right corner settings menu offers a "Customize" option which allows you to drag and drop various shortcut icons into your browser window. Open a new window. 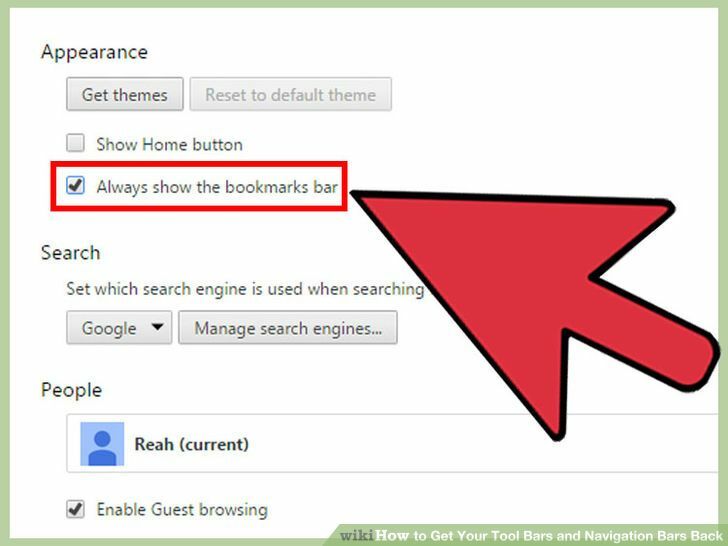 If you suddenly find your navigation bar missing (the area with your current internet address), there are a few things you can try. The first is simply opening a new browser window. + is a quick shortcut for PCs, while + is the shortcut for Macs. Note: The new window method will restore the navigation bar if the underlying issue is a pop-up window that has hidden this tool bar. Delete the sessionstore.js file. 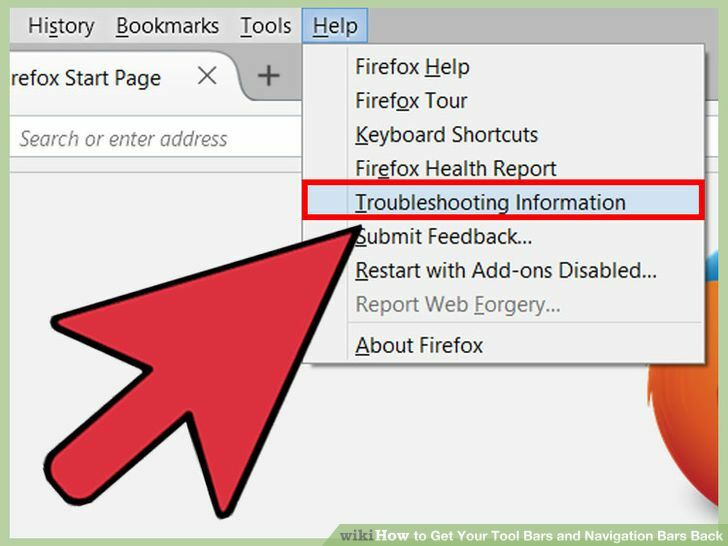 This file, which stores the current browser session data, is located in the Firefox profile folder and can be accessed through Help -> Troubleshooting Information->Profile Folder (under Application Basics). Once found, click the button to the right labeled either "Show in Finder" (Mac) or "Show Folder" (PC) then delete. 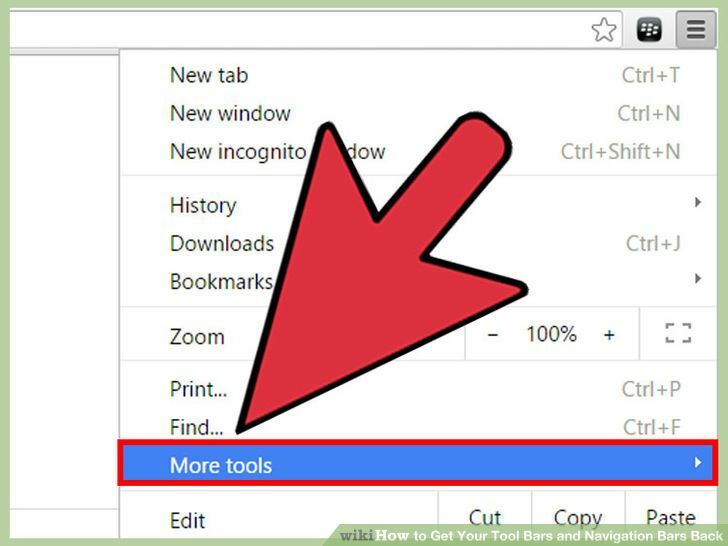 Deleting this file effectively restores Firefox to its settings before you began the session and may be able to bring back your tool bars in the process. Access the View menu. For suddenly missing toolbars in Chrome, try looking under the "View" menu located 4th from the left along the uppermost menu bar on your screen (after "Chrome", "File", and "Edit"). A checkmark next to "Always Show Bookmarks Bar" means that the Bookmarks Bar is currently visible. 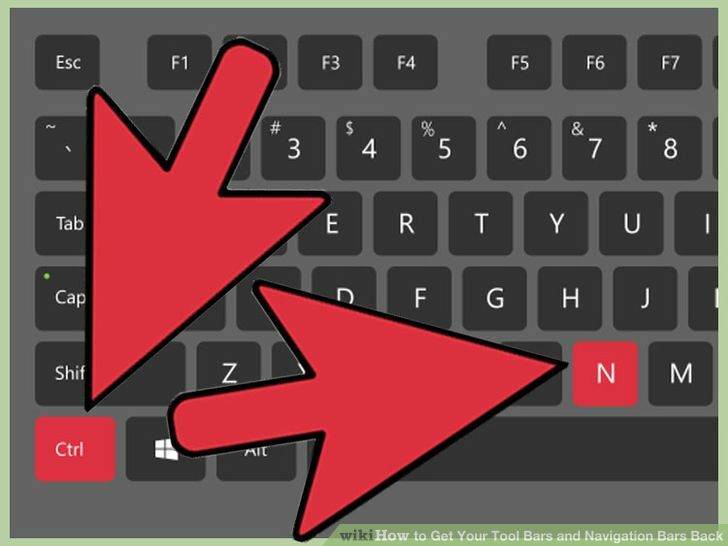 For the bookmark tool bar specifically, try keyboard shortcut + (for PCs) or ++ (for Macs). Exit full screen mode. One reason you may find your Chrome navigation bar hidden is that you've inadvertently lapsed into full screen mode. To toggle this mode on and off use the keyboard shortcut ++ (for PCs) or ++ (for Macs). Manage your extensions. 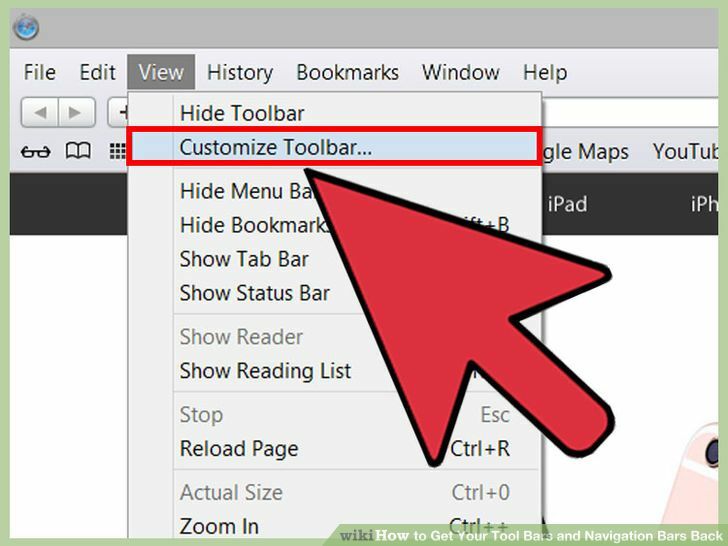 Too many Chrome extensions installed and visible in your tool bar area may be hiding your navigation bar from view and in some cases these extensions may even be hiding the bar programmatically. Look through and manage (i.e. delete or disable) your extensions by accessing the upper right corner settings menu, then clicking "More Tools", then "Extensions". Access the View menu. Within Safari this menu offers several different options of tool bars to hide or show. 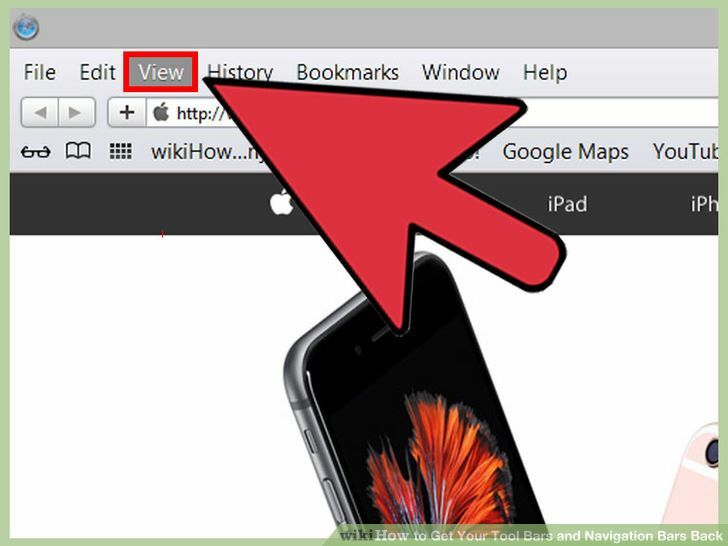 The "View" menu is located in the top menu bar of your screen, 4th from the left after "Safari", "File", and "Edit" menus. If your tool bar is suddenly invisible, check here first. Customize your tool bars. In Safari, during customization, it's possible to get rid of everything (even the navigation bar). If anything is missing try accessing this menu through View->Customize. From here you can drag and drop all the possible elements back into place, including the navigation bar itself. Restart Safari. Try closing the browser app entirely and restarting it. If something from your previous browser session was causing the tool bars to be hidden (for instance a pop-up window), this should restore your normal view. Reinstall Safari. If you're still having trouble after trying all of the above, consider uninstalling and then reinstalling the browser from a new (free) download. This should effectively reset all of Safari's default settings but will in the process erase any bookmarks, data, and other customizations you've accumulated. Toggle out of fullscreen mode. 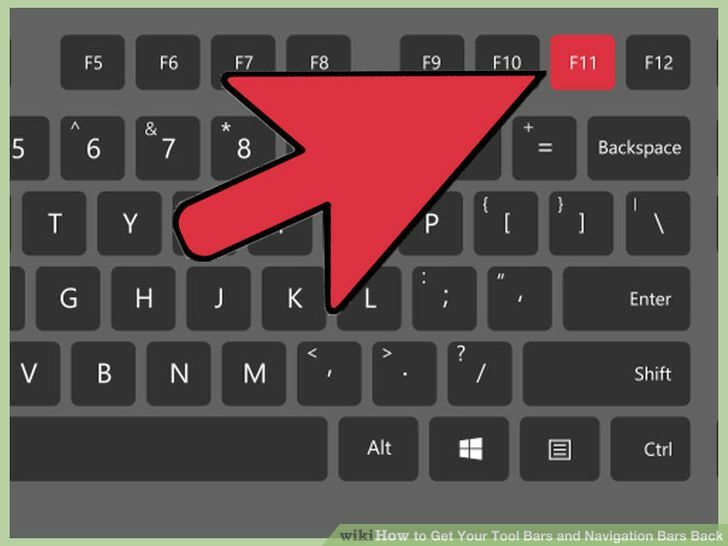 switches full screen on and off in Internet Explorer (IE) and this mode may be responsible for hiding your navigation or other tool bars. In Internet Explorer 8 try the shortcut ++. Reset Internet Explorer's settings. To do this first close all your open IE windows, then reopen the program. Click "Tools" then "Internet Options". Within that menu click "Advanced" and then "Reset". Then click "Reset" once more to confirm. The browser will go back to default settings and should bring back your navigation or other tool bars. You'll also need to restart your computer for this reset to take effect. Reinstall Internet Explorer. If nothing else is working, consider first uninstalling then subsequently reinstalling the browser. The download will be free and easy to find. This will reset all of Internet Explorer's default settings but will in the process erase any bookmarks, data, and other customizations you've acquired. Modern browsers often offer user profiles (e.g. Firefox Sync, Chrome user profiles). Being signed in means retaining all bookmarks, data, and custom tool bars across computers or after reinstalls. 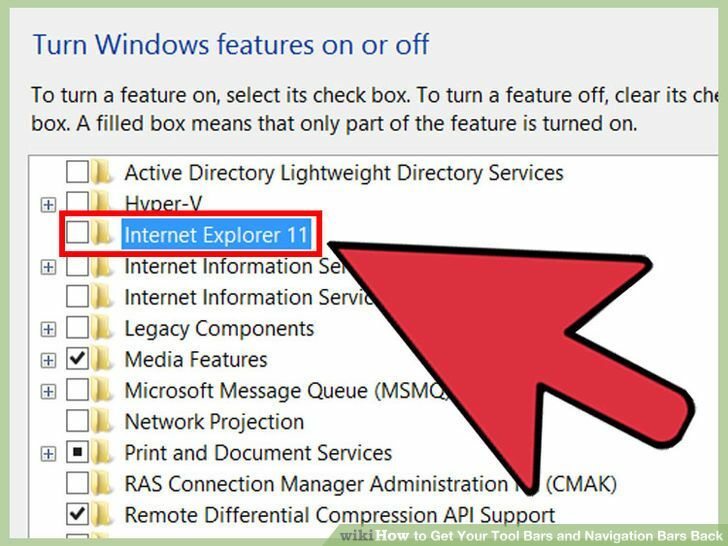 If your IE Home Page has been changed without your knowledge, or you have unwanted tool bars and links in the navigation area that keep returning, it could mean you have some spyware or other malicious software present. 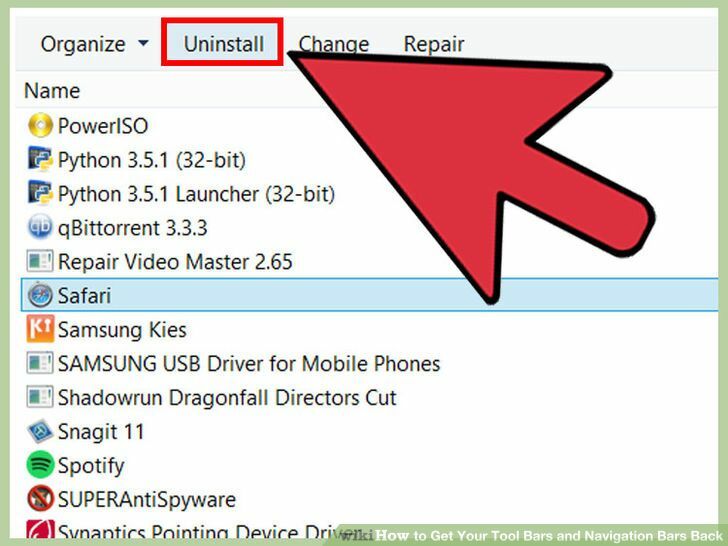 Look for help in uninstalling the programs or consult an expert if the issue persists.